I’m so excited to introduce you to my friend in real life and in blogland, Sarah Christine of SarahChristineStyle! Funny story how we met… you see, I already knew of her because I’ve known her boyfriend since middle school, and had seen pictures of them on Facebook. We ended up joining the same book club, and when Sarah friended me on Facebook she was confused on why we had so many of the same friends. Another twist? We both went to the same college AND high school! 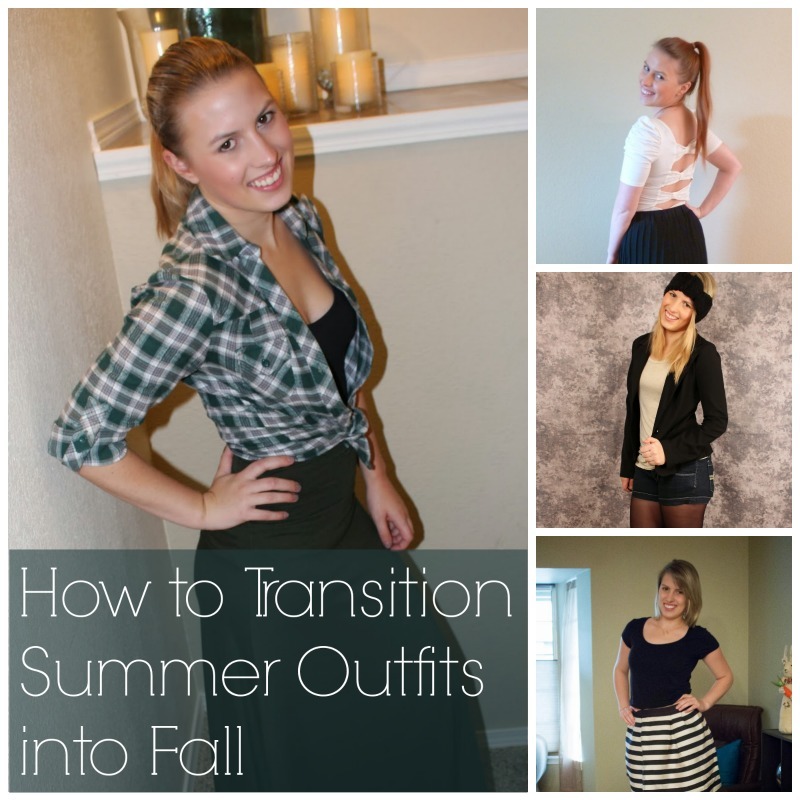 Anyways, Sarah has a fabulous post for you today on how to transition summer outfits to fall… take it away, Sarah! Hey hellorigby! readers, my name is Sarah Christine, and while I normally blog over at SarahChristineStyle I’m excited to be blogging over here for Jenn today while she is on vacation! (Are you as jealous as I am that she is at Disney right now?) Fall is by far my favorite season but I’d be lying if I didn’t say I love some of the summer fashion trends (my favorites can be found here) so today I’m sharing some of my go to ways to bring those summer trends (maxi skirts, crop tops, cute shorts, and open back tops) along into Fall. Let’s start with maxi skirts, I could seriously live in maxi skirts, they are so comfortable and surprisingly flattering. I used to think that being short meant I would never be able to wear maxi’s, but once I found my first one that fit I couldn’t stop buying them and quickly became obsessed with them. You couldn’t get me to give up my maxi skirts for Fall if you tried. My favorite way to wear them in the Fall is with ballet flats and a flannel shirt knotted up to keep the flattering shape that the maxi skirt offers. More details on this outfit can be found here. It took me forever to finally jump on the crop top bandwagon, but once I did I couldn’t take them off. If worn correctly this trend can be really flattering, pulling your waistline up to the thinnest part of your body. Generally when you think of crop tops you think of summer music festivals, but pairing them with a cute high-waisted skirt and ankle booties help transition any crop top into the Fall. Shorts are one of those things that you don’t generally see a lot of once you hit the Fall and Winter months, but a few years ago I found outfit inspiration on Pinterest that I couldn’t wait to try out, a way that I could wear some of my shorts even once the weather decided to get a little cooler. Now I just layer my shorts with some tights for the cooler season. My back is easily my favorite part of my body, and because of that I love to wear open back tops. Anything with a cute or open back is practically already in my cart, and just like with the other options we’ve discussed I am never ready to let them go once Fall rolls around. For the Fall usually though I pair them with a cute jacket or something that I wear while I’m out and then the flair from the back is a special surprise once I arrive where I am going. Now I would love to hear from you, what are your favorite spring trends, how do you transition them into Fall with you? Thanks so much for the great post, Sarah! You can follow SarahChristineStyle on Bloglovin’, Twitter, Facebook, Instagram, or Pinterest! I love the striped skirt from H&M from the crop top look! I just love Sarah! That crop top and skirt outfit is SO CUTE. Me too, she’s great! I know right? I’m loving that on her! love your outfits – not sure i’ll ever jump on the crop top wagon but it looks great on you! Love the idea of wearing a check shirt tied on top of a Summer dress. Great looks, fab ideas! Lovely outfits, especially the last one! So glad they were helpful, Jess! I love it too – maxi skirts are a great wardrobe staple! Thanks so much, Asia! I’ll check it out. Plaid shirts are my favorite too!